So, it’s the first day of spring! I know that many people are still facing freezing temperatures and icy conditions, but here in the Bay Area, it’s starting to warm up (and, honestly, it never gets that cold) and we’re preparing for the usual rainy season. In fact, after a few sunny afternoons in the past few days, the rain and dreariness has started creeping in today. 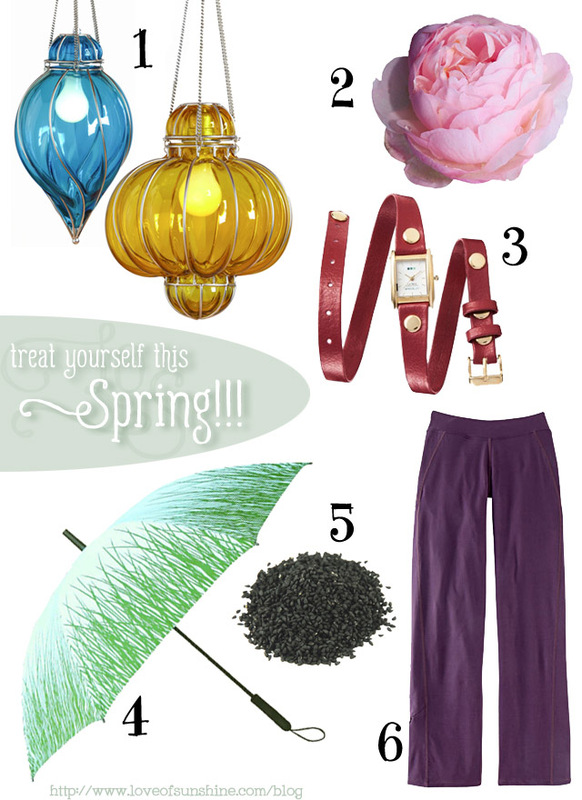 Definitely time to grab a few items to brighten the day and prepare for the incoming April Showers. Venetian Glass Pendants. I have always loved the look of these and now, World Market has a few affordable pendants. It’s like the made them just for me. One of each, please. Peonies. I’m usually a gerbera daisy kinda girl, but I also love peonies and they are quintessentially spring. I’m planning on getting a few for my Easter centerpiece. Wrap watch. I have lusted after Red Monkey Design’s wrap watch for a long while, but couldn’t bring myself to spend so much on a watch. Then, I found this very similar watch at Target. They normally sell for $40, but I found mine for half price. Spring Grass Umbrella. I love Tray 6 umbrellas. They have great designs in fun colors and are really well constructed. I have three and rotate them out because I love them all. I think everyone should have a brightly colored umbrella to not just keep them dry, but also combat any rainy day dreariness. Nigella Seeds. Also known as charnushka and kalageera, I had a hard time tracking these down at first. My mother-in-law suggested I try Penzey’s Spices for all my hard-to-find needs. And she was right. I got my shipment in just today. Now I can actually make this recipe without substituting mustard seeds (which tasted great, but it’s nice to try a recipe as it’s meant to be). Dream Pants. I love these pants from Title Nine and would live in them if I didn’t like wearing skirts so much. They are my ultimate comfortable (but not slouchy-looking) pants and I wear them for working out, lounging, napping and play dates with Lil’Man. I have even worn them to work, but my office dress code is pretty relaxed, so I wouldn’t suggest that for everyone.